Tumor-specific effector T cells (TE) are naturally sensitized within the L-selectinlow (CD62Llow) fraction of tumor-draining lymph nodes (TDLN). Whether isolated from day 9 (D9) or day 12 (D12) TDLN, 5 million L-selectinlow TE could be culture activated and adoptively transferred to achieve complete rejection of established intradermal, pulmonary, and brain tumors. Surprisingly, although 25 million unfractionated T cells from D9 TDLN were equally effective, even 100 million unfractionated T cells from D12 TDLN seldom prevented lethal intradermal tumor progression, despite a pronounced therapeutic excess of TE. This highly reproducible treatment failure was due to cotransfer of tumor-induced, L-selectinhigh suppressor T cells (TS) which were also present in D12 TDLN. In contrast, D9 TDLN and normal spleens lacked L-selectinhigh TS. Only those L-selectinhigh D12 TDLN T cells that down-regulated L-selectin during culture activation were suppressive in vivo and in vitro, and, like L-selectinlow TE, trafficked promptly into tumors following i.v. administration. This is the first demonstration that adoptive immunotherapy can fail as a direct result of passenger TS that share certain phenotypic and trafficking features of TE, even when otherwise curative doses of TE have been administered. Furthermore, in contrast to recently described CD4+CD25+ TS and plasmacytoid dendritic cell-activated TS, tumor-induced L-selectinhigh TS prevent tumor rejection via blockade of sensitized, activated TE rather than via afferent blockade. Two functionally distinct classes of memory T cells, memory effector and central memory T cells, have recently been distinguished (1, 2, 3, 4, 5, 6, 7). Central memory T cells, notable for high surface expression of L-selectin and CCR7, home to and proliferate within secondary lymphoid organs (1). In contrast, memory effector T cells are distinguished by low surface expression of L-selectin and CCR7, and display a distinctive capacity to recirculate freely throughout the body until relevant Ag is encountered (1, 3). Such encounter can trigger clonal expansion of memory effector T cells directly within extra-lymphoid organs, leading to stable long-term colonization of those peripheral tissues (1, 3, 4, 5). In mouse tumor models, the small (<15%) subset of L-selectinlow (CD62Llow) T cells within tumor-draining lymph nodes (TDLN)3 includes pre-effector T cells that are naturally sensitized to tumor Ag (8, 9). These pre-effectors can be activated ex vivo by anti-CD3 followed by IL-2 treatment to generate CD4+ and helper-independent CD8+ effector T cells (TE) that retain low L-selectin expression (10, 11). When adoptively transferred into syngeneic mice, such L-selectinlow effector T cells induce regressions of the relevant tumor at all tested anatomic locations, including pulmonary, intradermal (i.d. ), and intracranial tumors (11). Consistent with memory effector function, these TE redistribute freely into peripheral tumor sites following i.v. injection and proliferate directly within tumor beds (9, 12, 13).4 Nonetheless, the efficacy with which L-selectinlow TE initially accumulate at individual tumor sites varies considerably, probably due to differences in tumor vascularization and local proinflammatory events (12). Given such variances, successful immunotherapy of human cancer requires strategies that enable tumor rejection at sites of relatively low as well as high initial accumulation of TE. Therefore, we have extensively compared the mechanisms of tumor rejection under each such circumstance. In many murine tumor models, established i.d. tumor challenges are consistently more difficult to treat with T cell adoptive immunotherapy (AIT) when compared with similarly timed pulmonary or even intracranial challenges (9, 11). The doses of TE required to cure such experimental tumor challenges (i.d.≫brain>lung) correlate inversely to their observed trafficking efficiency into these tumor sites (11, 14). However, even at therapeutically effective doses, far fewer TE initially accumulate within established i.d. tumors compared with other studied anatomic sites (12). The remarkable ability of tumor-specific TE nonetheless to cure even experimental i.d. tumors may depend upon their compensatory proliferation within the tumor bed, as well as upon sustained recruitment of additional cellular rejection elements over a period of days or even weeks (9, 15).4 However, such a protracted rejection mechanism may be intrinsically more vulnerable to immunosuppressive modulations by tumor cells or by other host elements. In this paper, we report that TE-mediated rejection of i.d. tumors can be blocked by deliberate or inadvertent coadministration of suppressor T cells (TS) that are also induced in TDLN by day 12 (D12) of tumor progression. In contrast to TE, which are already L-selectin down-regulated at TDLN harvest (8, 9, 10), tumor-induced TS are phenotypically L-selectinhigh at initial harvest. However, only L-selectinhigh T cells that down-regulate L-selectin expression during culture activation (L-selectinhigh→low) display suppressive activity both in vivo and in vitro. Similar to L-selectinlow TE, L-selectinhigh→low TS display the capacity to traffic readily into tumor beds following adoptive transfer. The ability of these TS to achieve effector T cell blockade (i.e., suppress already sensitized and activated TE) is in contrast to recently characterized CD4+CD25+ and other negative regulatory T cells that primarily antagonize the afferent limb of the immune system (16, 17, 18, 19). Mechanical elimination of the L-selectinhigh subpopulation in D12 TDLN before culture activation renders L-selectinlow TE uniformly effective as AIT against pulmonary, intracranial, and i.d. tumor challenges, regardless of their relatively high or low initial accumulation at these tumor sites. Female C57BL/6N (B6) and BALB/c mice were from the Biologic Testing Branch of the National Cancer Institute (Frederick, MD). B6.PL-Thy1a/Cy (Thy1.1) mice were from The Jackson Laboratory (Bar Harbor, ME). They were maintained in a pathogen-free environment and used for experiments at 8–10 wk of age. The MCA-205, MCA-203, and MCA-207 fibrosarcomas, syngeneic to B6 mice, were serially passed in vivo s.c. from cryopreserved mince and used within the eighth transplantation generation (11). The CT-26 colon adenocarcinoma, syngeneic to BALB/c mice, was provided by G. Nabel (Vaccine Research Center, National Institutes of Health, Bethesda, MD) and similarly maintained. Single-cell suspensions were prepared from solid tumors by digestion with 0.1% collagenase, 0.01% DNase, and 2.5 U/ml hyaluronidase (Sigma-Aldrich, St. Louis, MO) for 2 h at room temperature (11). These suspensions were injected i.d. to establish i.d. tumors, intracranially to establish intracranial tumors, or i.v. to establish pulmonary tumors. The MEL-14 hybridoma producing mAb against mouse L-selectin was obtained from the American Type Culture Collection (Manassas, VA) (8). PE-, FITC-, or CyChrome-conjugated rat anti-mouse reagents to CD3, CD4, CD8, Thy1.1, Thy1.2, L-selectin (CD62L), CD25, CD28, CTLA-4 and CD44, as well as subclass-matched control Ab and FITC-conjugated goat anti-rat and mouse anti-rat Ab were purchased from BD PharMingen (San Diego, CA). FACS analyses were performed as previously described (11). Mice were inoculated i.d. with 1.5 × 106 syngeneic tumor cells in each flank. Nine or 12 days later, inguinal TDLN were harvested, and single-cell suspensions prepared mechanically. Immunocolumns containing glass beads coated with goat anti-rat IgG (Rat T; Cedarlane Laboratories, Hornby, Ontario, Canada) and mouse CD62L MicroBeads (Miltenyi Biotec, Auburn, CA) were used to isolate TDLN L-selectinlow and L-selectinhigh subpopulations, respectively. For L-selectinlow preparations, TDLN cells were preincubated for 20 min at 4°C with Mel-14 ascites at 1/10,000 dilution. Cells were washed in Ca2+/Mg2+-free HBSS, and then applied to Rat T columns to isolate L-selectinlow T cells. The first 50-ml pass-through fraction was highly purified (>95%) for L-selectinlow cells by indirect fluorescent analysis. To prepare L-selectinhigh TDLN T cells, lymphocytes were washed in MACS buffer (PBS with 2 mmol EDTA and 0.5% BSA), incubated 30 min at 4°C with 40 μl/ml of mouse CD62L MicroBeads, washed again, and then loaded at 100–200 × 106 cells per Midi-MACS column. After rinsing, the positive fraction was collected by plunging 5 ml buffer off the magnet. In some experiments, cells were additionally separated into L-selectinhigh and L-selectinlow subpopulations following 5-day culture using Dynabeads M-450 (Dynal, Lake Success, NY) at a 4:1 beads:cell ratio for L-selectin separation. TDLN T cell preparations were activated on 24-well plates precoated with anti-CD3 mAb (8, 11). Each well contained 4 × 106 cells in 2 ml of complete medium, consisting of RPMI 1640 plus 10% heat-inactivated FCS, 0.1 mM nonessential amino acids, 1 mM sodium pyruvate, 2 mM fresh l-glutamine, 100 mg/ml streptomycin, 100 U/ml penicillin, 50 mg/ml gentamicin, 0.5 mg/ml Fungizone (Life Technologies, Grand Island, NY), and 0.05 mM 2-ME (Sigma-Aldrich). After a 2-day incubation at 37°C, activated cells were suspended in 24 IU/ml human rIL-2 (Chiron, Emeryville, CA) at 1–2 × 105/ml, cultured in 24-well plates or gas-permeable culture bags (Baxter Healthcare, Deerfield, IL) for 3 days, and then harvested. For AIT, mice received culture-activated TDLN T cells, either unfractionated (UnF) T cells, fractions purified for low or high L-selectin expression, or combined fractions. When purified L-selectinlow and L-selectinhigh fractions were combined before or after culture, we combined them in ratios simulating their naturally occurring proportions in UnF preparations. 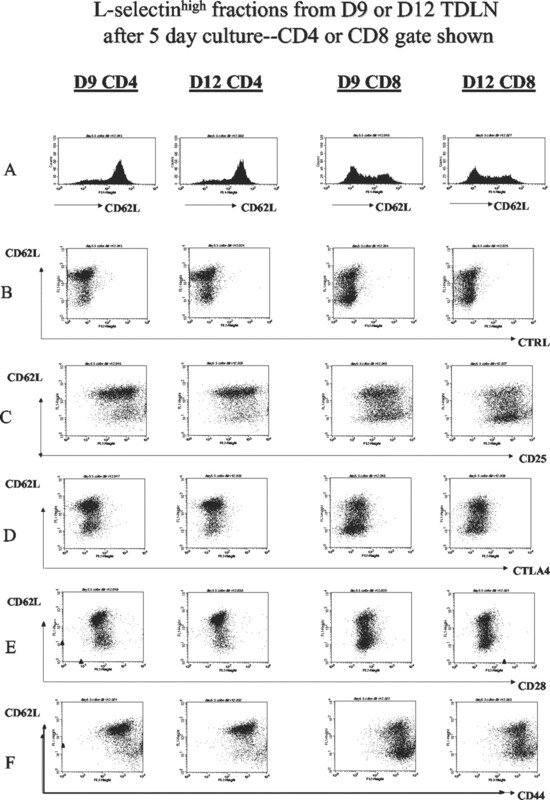 Before culture, the observed ratio of L-selectinlow:L-selectinhigh T cells typically ranged between 1:4 and 1:8. To gauge each subpopulation’s proliferative kinetics during combined culture activation, we preliminarily used congenic Thy1.1 B6-background mice as a source of L-selectinhigh D12 TDLN T cells and Thy1.2 mice as a source of L-selectinlow D12 TDLN T cells. Postculture FACS analysis based on Thy1.1 vs Thy1.2 expression demonstrated that the initially L-selectinlow (Thy 1.2) and initially L-selectinhigh (Thy 1.1) subpopulations each proliferated to a similar degree during 5-day coculture, thus maintaining their original 1:4–1:8 ratio despite reproducible modulations in their L-selectin expression (our unpublished data). In all experiments reported in Results, TDLN T cell fractions were prepared from normal B6 or BALB/c mice. To establish i.d. tumors in healthy syngeneic mice, 1.5 × 106 viable tumor cells in 50 μl of HBSS were injected into the midline ventral skin. Because regressions of i.d. tumors following T cell adoptive transfer are not observed in the absence of adjunct immunosensitization such as sublethal irradiation or cyclophosphamide (14), 3 days after tumor inoculation, mice received conventional immunosensitizing sublethal whole body irradiation (WBI, 500 rad) from a cesium-137 source (11), followed by infusion of 5-day culture-activated T cells in 1.0 ml of HBSS by tail vein. Perpendicular bidimensional tumor measurements were performed twice weekly with a Vernier caliper, and the square root of the product scored as the tumor diameter. Experiments were terminated 42–45 days following initial tumor injection. Historically, mice challenged with weakly immunogenic i.d. tumors that progressed to ≥14 mm diameter subsequently experienced lethal tumor progression regardless of therapy, whereas mice displaying complete regression of established i.d. tumors were cured. Mice with i.d. tumors were euthanized and scored as dead from lethal tumor progression when the i.d. tumor diameter exceeded 14 mm to spare mice subsequent comorbidities. Syngeneic B6 mice were simultaneously challenged by 1.5 × 106 MCA-205 tumor cells i.d., 0.1 × 106 MCA-205 tumor cells intracranially, and 0.3 × 106 MCA-205 tumor cells i.v. to establish synchronous tumors. Pilot experiments confirmed that tumor-challenged control mice (without AIT) developed synchronous visceral as well as directly measurable i.d. tumors. Mice were monitored for symptoms of tumor progression mandating euthanasia. Early morbidity from progressive pulmonary metastases consistently preceded the development of any symptoms related to intracranial or i.d. tumors. AIT was initiated 3 days after tumor challenges, following immunosensitizing WBI (500 rad). For fluorochrome labeling, culture-activated L-selectinlow T cells at 1 × 106/ml in HBSS were incubated with 0.5 μg/ml tetramethylrhodamine isothiocyanate (TRITC; Sigma-Aldrich) for 40 min at 37°C (12), and thenwashed twice and resuspended for adoptive transfer. Culture-activated L-selectinhigh subpopulations at 1 × 107 cells/ml were incubated with 5 μM CFSE (Molecular Probes, Eugene, OR) in HBSS for 10 min at 37°C, and then washed twice and resuspended for adoptive transfer. 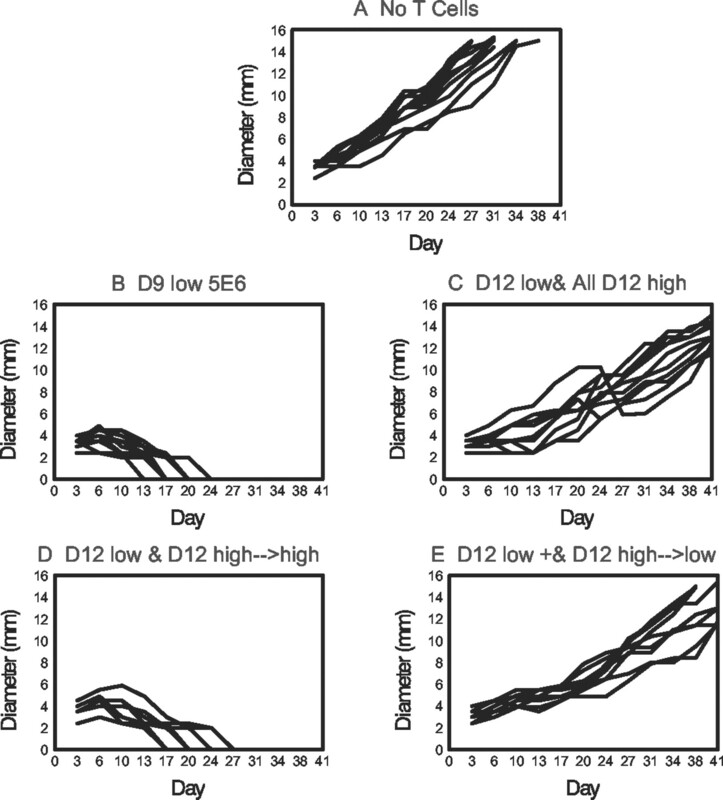 Syngeneic mice bearing 3-day i.d. tumors received 500 rad and then were injected i.v. with labeled T cells. Mice were sacrificed 24 h after adoptive transfer; i.d. tumors were harvested, fixed in 4% formalin for 24 h, placed in 30% sucrose for an additional 24 h, snap-frozen in n-hexane at −70°C, and cut into 8-μm sections on a cryostat. Sections were then mounted in Vectashield (Vector Laboratories, Burlingame, CA) and examined confocally using a Leica TCS-SP laser-scanning microscope (Heidelberg, Germany). Culture-activated T cells (2 × 106) were exposed in 24-well-plate wells to 0.5 × 106 irradiated (5000 rad) tumor stimulator cells that were whole-cell enzymatic digests of in vivo passed tumors. After 24 h at 37°C, the supernatants were collected and stored at −70°C for IFN-γ assays. 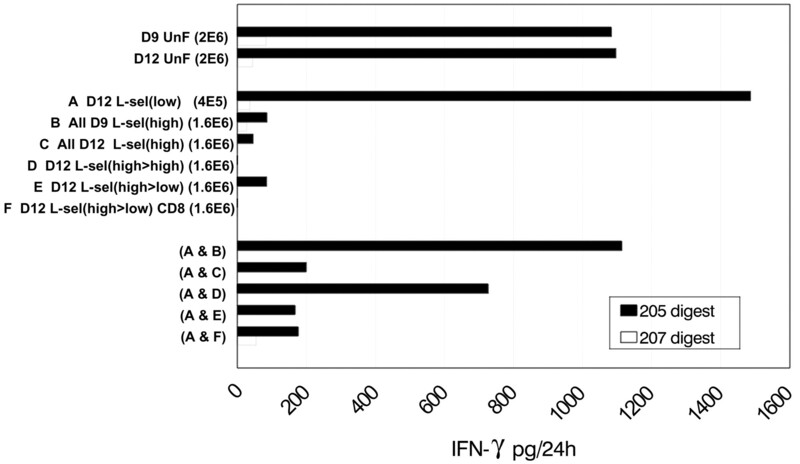 Concentrations of IFN-γ were measured by ELISA using paired mAb and standards purchased from BD PharMingen as described previously (11). Survival among treatment groups was compared by the Mann-Whitney rank sum test. In addition, individual mice were scored for final treatment outcome (lethal or persistent tumor vs cure) and treatment groups compared. A two-tailed p2 value of <0.050 was considered significant. TDLN T cells harvested from mice bearing weakly immunogenic tumors contained a minor (<15%) subpopulation of L-selectinlow T cells. When this fraction was isolated from either day 9 (D9) or D12 TDLN, and then culture activated and adoptively transferred into syngeneic mice, 5 × 106 L-selectinlow T cells consistently cured recipient mice bearing 3-day established pulmonary, intracranial, and i.d. tumors (see below and Refs. 11 and 14). As reported previously, cure following such AIT was antigenically restricted to the tumor used for TDLN sensitization and required intratumoral T cell infiltration (8, 9, 10, 11, 13). Furthermore, no adjunct treatment such as rIL-2 was necessary for cure (11). In contrast to isolated L-selectinlow T cells, which were therapeutically effective whether obtained from D9 or D12 TDLN, a marked therapeutic disparity was observed when we compared the potentials of UnF T cells from D9 TDLN to those from D12 TDLN in treating established i.d. tumors. Culture activation and adoptive transfer of even 100 × 106 UnF T cells from D12 TDLN resulted in survival prolongation but almost invariably failed to prevent lethal i.d. tumor progression (Figs. 1⇓ and 2⇓). In contrast, as few as 25 × 106 culture-activated UnF T cells from D9 TDLN were consistently as efficient as 5 × 106 purified D9 or D12 L-selectinlow T cells for achieving i.d. tumor rejection (Fig. 2⇓). This striking therapeutic disparity was observed for both CT-26 and MCA-205 i.d. tumors in syngeneic BALB/c and B6 mice, respectively, indicating that this phenomenon was not restricted to a single tumor model or mouse strain (Figs. 1⇓ and 2⇓). AIT of 3-day established i.d. MCA-205 tumors, T cells from D9 vs D12 TDLN compared. Syngeneic B6 mice were injected intraflank with 1.5 × 106 MCA-205 cells as in Fig. 1⇑ to synchronously prepare D9 and D12 TDLN UnF and L-selectinlow T cell groups. Following 5-day culture activation, individual groups were harvested and administered to B6 mice with 3-day established i.d. tumors. The treatment groups (10 mice per group, except group B = 5 mice) were as follows: A, No T cells; B, L-selectinlow T cells (5 × 106) from D9 TDLN (D9 l-sel(low) 5E6); C, UnF T cells (25 × 106) from D9 TDLN (D9 UnF 25E6); D, UnF T cells (50 × 106) from D9 TDLN (D9 UnF 50E6); E, UnF T cells (25 × 106) from D12 TDLN (D12 UnF 25E6); F, UnF T cells (50 × 106) from D12 TDLN (D12 UnF 50E6); and G, UnF T cells (100 × 106) from D12 TDLN (D12 UnF 100E6). Mice received 500 rad WBI before adoptive transfer. Displays are as in Fig. 1⇑. This is a composite of two experiments. All treatments except E significantly improved survival compared with “No T cell” group (A vs B, C, D, and G, p1 = 0.001; A vs F, p1 = 0.007; A vs E, p1 = 0.032). In contrast, treatment outcome (cure vs lethal or persistent tumor) was significantly different for A vs B/C/D (p1 = 0.001), but not for A vs E/F (p1 = 1.0) or A vs G (p1 = 0.151). Because UnF T cells culture activated from D12 TDLN provided effective AIT for both established pulmonary and intracranial tumors in previous experiments, their ineffectiveness against i.d. tumors compared with UnF T cells from D9 TDLN was unanticipated (8, 9, 10, 11, 14). We sought to authenticate this therapeutic incongruity by performing AIT against simultaneous 3-day challenges of i.d., intracranial, and pulmonary tumors. Without AIT, triply challenged mice died of visceral tumor by day 25 of challenge, with progressive i.d. tumors also evident (Fig. 3⇓). Mice treated with 5 × 106 L-selectinlow or 50 × 106 UnF T cells culture activated from D9 TDLN were cured of all three challenges, as were mice treated with 5 × 106 L-selectinlow T cells from D12 TDLN (Fig. 3⇓). In contrast, mice treated with 50 × 106 UnF T cells culture activated from D12 TDLN survived with no evidence of visceral disease yet developed progressive i.d. tumors (Fig. 3⇓). AIT of triply challenged mice (i.d., intracranial, and pulmonary tumors) comparing T cells from D9 vs D12 TDLN. Syngeneic B6 mice were injected intraflank with MCA-205 as in Fig. 1⇑ to synchronously prepare D9 and D12 TDLN UnF and L-selectinlow T cell groups. Following routine 5-day culture activation, individual groups were harvested and administered to B6 mice with synchronous 3-day established MCA-205 i.d., intracranial, and pulmonary tumors, as described in Materials and Methods. Treatment groups (5 mice per group) were as follows: A, No T cells; B, L-selectinlow T cells (5 × 106) from D9 TDLN (D9 l-sel(low) 5E6); C, UnF T cells (50 × 106) from D9 TDLN (D9 UnF 50E6); D, L-selectinlow T cells (5 × 106) from D12 TDLN (D12 L-sel(low) 5E6); and E, UnF T cells (50 × 106) from D12 TDLN (D12 UnF 50E6). Mice received 500 rad WBI before adoptive transfer. As in Fig. 1⇑, displays show day following tumor inoculation vs tumor diameter, except inset shows day vs survival (% of mice surviving). During the course of this experiment, the only cause of death was progressive pulmonary metastases. All treatments significantly improved survival compared with the “No T cell” group (A vs B/C/D/E; p1 = 0.001). In contrast, treatment outcome (cure vs lethal or persistent tumor) was significantly different for A vs B/C/D (p1 = 0.001), but not for A vs E (p1 = 1.0). Mice were challenged with tumor on a staggered schedule to allow same-day harvest of D9 and D12 TDLN, from which individual L-selectinlow and L-selectinhigh T cells subpopulations were purified. Fractions were recombined before culture activation in proportions approximating their natural representation in UnF TDLN. The inclusion of D12 L-selectinhigh T cells rendered D9 L-selectinlow T cells ineffective as subsequent AIT against i.d. tumors. In contrast, the inclusion of D9 L-selectinhigh T cells did not prevent i.d. tumor rejection by D12 L-selectinlow T cells (Fig. 4⇓). Culture-activated L-selectinhigh T cells from D12 but not D9 TDLN inhibit AIT of established i.d. tumors by L-selectinlow TE. Syngeneic B6 mice were injected intraflank with MCA-205 to synchronously prepare D9 and D12 TDLN T cells. UnF groups were culture activated separately, while individual purified fractions were combined before culture activation in proportions approximating their natural representation in UnF T cells, while assuring a therapeutic excess of L-selectinlow TE (4:1 ratio of L-selectinhigh: L-selectinlow T cells). Individual groups were harvested and administered to B6 mice with 3-day established MCA-205 i.d. tumors. Treatment groups (5 mice per group) were as follows: A, No T cells; B, UnF T cells (50 × 106) from D9 TDLN (D9 UnF); C, UnF T cells (50 × 106) from D12 TDLN (D12 UnF); D, T cells (50 × 106) from combined culture of D9 L-selectinlow plus D12 L-selectinhigh T cells (D9(low) + D12(high)); and E, T cells (50 × 106) from combined culture of D12 L-selectinlow plus D9 L-selectinhigh T cells (D12(low) + D9(high)). Mice received 500 rad WBI before adoptive transfer. Displays are as in Fig. 1⇑. All treatments significantly improved survival compared with the “No T cell” group (A vs B/C/D/E; p1 = 0.001). In contrast, treatment outcome (cure vs lethal or persistent tumors) was significantly different for A vs B/E (p1 = 0.001), but not for A vs C/D (p1 = 1.0). This is representative of three experiments. We investigated whether suppression of L-selectinlow TE by D12 L-selectinhigh TDLN T cells required their coculture before adoptive transfer. Freshly processed D12 L-selectinhigh TDLN T cells were introduced to D9 L-selectinlow T cells before or after culture activation in proportions approximating their natural representation in UnF preparations (see Materials and Methods) and then administered as AIT. i.d. tumor rejection by L-selectinlow TE was suppressed even when introduction of separately culture-activated D12 L-selectinhigh TDLN T cells was delayed until adoptive transfer (Fig. 5⇓). In contrast, identically processed L-selectinhigh T cells from normal syngeneic spleen failed to inhibit i.d. tumor rejection whether introduced to L-selectinlow TE before or after culture activation (our unpublished data). Culture-activated L-selectinhigh T cells from D12 TDLN suppress AIT when introduced to L-selectinlow TE before or after culture activation. Synchronous D9 and D12 UnF or purified L-selectinlow and L-selectinhigh fractions were prepared from MCA-205 TDLN and variously combined before and after culture activation as described in Fig. 4⇑. Individual groups were harvested and administered to B6 mice with 3-day established MCA-205 i.d. tumors. Treatment groups (5 mice per group) were as follows: A, No T cells; B, L-selectinlow T cells (5 × 106) from D9 TDLN (D9 l-sel(low) 5E6); C, UnF T cells (50 × 106) from D12 TDLN (D12 UnF); D, T cells (50 × 106) consisting of D9 L-selectinlow plus D12 L-selectinhigh T cells combined before culture activation at a 1:4 ratio (D9(low) + D12(high) preculture); and E, T cells (50 × 106) consisting of 10 × 106 D9 L-selectinlow plus 40 × 106 D12 L-selectinhigh T cells combined after separate culture activation at the moment of adoptive transfer (D9(low) + D12(high) postculture). Mice received 500 rad WBI before adoptive transfer. Displays are as in Fig. 1⇑. All treatments significantly improved survival compared with the “No T cell” group (A vs B/C/D/E; p1 = 0.001). In contrast, treatment outcome (cure vs lethal or persistent tumors) was significantly different for A vs B (p1 = 0.001), but not for A vs B/D (p1 = 1.0) or A vs C (p1 = 0.690). Results are representative of three experiments. Tumor-induced L-selectinhigh TS are not antigenically restricted to tumor-specific transplantation Ag (TSTA). When adoptively transferred as therapy, TE derived from MCA-205-, MCA-207-, or MCA-203-sensitized mice typically reject solely the tumor of sensitization, indicating that rejection is mediated through recognition of TSTA rather than shared tissue Ag (8, 9, 10, 11, 13). Similarly, in vitro, culture-activated TE specifically secrete IFN-γ only when exposed to the relevant TSTA-expressing tumor (11, 20). To determine whether TS from D12 TDLN were also TSTA restricted, we purified L-selectinhigh T cell fractions from D12 TDLN of syngeneic mice bearing MCA-205 or MCA-203, and then proportionately combined these fractions before culture activation with L-selectinlow T cells purified from MCA-205 TDLN. As depicted in Fig. 6⇓, adding L-selectinhigh T cells from either D12 MCA-205 or D12 MCA-203 TDLN suppressed the subsequent capacity of MCA-205-sensitized TE to reject MCA-205 i.d. tumors, indicating that TS were not TSTA restricted. Also consistent with this observation, cultured L-selectinhigh T cells from TDLN of mice bearing a third tumor, MCA-207, also suppressed rejection of MCA-205 i.d. tumors when added to MCA-205-sensitized L-selectinlow TE at the time of adoptive transfer (our unpublished data). Culture-activated L-selectinhigh T cells from D12 TDLN draining either MCA-205 or MCA-203 inhibit AIT of established MCA-205 i.d. tumors by L-selectinlow TE. Syngeneic B6 mice were injected intraflank with 1.5 × 106 MCA-205 or MCA-203 cells as in Fig. 1⇑ to synchronously prepare D9 and D12 TDLN T cells. Purified fractions were combined before culture activation in same ratios as in Fig. 4⇑. Individual groups were harvested and administered to B6 mice with 3-day established MCA-205 i.d. tumors. Treatment groups (5 mice per group) were as follows: A, No T cells; B, L-selectinlow T cells (5 × 106) from D9 TDLN (D9 L-sel(low) 5E6); C, T cells (50 × 106) from combined culture of MCA-205-sensitized D9 L-selectinlow plus MCA-205-sensitized D12 L-selectinhigh T cells (D9(low) + D12(high), 205 TDLN); D, T cells (50 × 106) from combined culture of MCA-205-sensitized D9 L-selectinlow plus MCA-203-sensitized D12 L-selectinhigh T cells (D9(low) + D12(high), 203 TDLN). Mice received 500 rad WBI before adoptive transfer. Displays are as in Fig. 1⇑. All treatments significantly improved survival compared with the “No T cell” group (A vs B/C/D, p1 = 0.001). In contrast, treatment outcome (cure vs lethal or persistent tumors) was significantly different for A vs B (p1 = 0.004), but not for A vs C/D (p1 = 1.0). We previously reported that tumor-specific TE in TDLN display low L-selectin expression at initial TDLN harvest and remain L-selectinlow during culture activation (8, 10). Therefore, we investigated whether the suppressor activity of D12 TDLN T cells is associated with maintained (L-selectinhigh→high) or with down-regulated (L-selectinhigh→low) L-selectin expression during culture activation. As seen in Fig. 7⇓, initially L-selectinhigh TDLN T cell fractions became heterogeneous for L-selectin expression after 5-day culture activation. This was an infrequent event in the CD4+ subset but was a frequent event in the CD8+ subset. Following culture activation, initially L-selectinhigh TDLN T cell fractions included only 1–4% L-selectinhigh→low CD4+ T cells, but 37–42% L-selectinhigh→low CD8+ T cells (Fig. 7⇓). No clearly distinctive modulations of CD25, CTLA-4, CD28, CD40L, or CD44 were identified when suppressive D12 and nonsuppressive D9 L-selectinhigh→low fractions were comparatively analyzed (Fig. 7⇓). 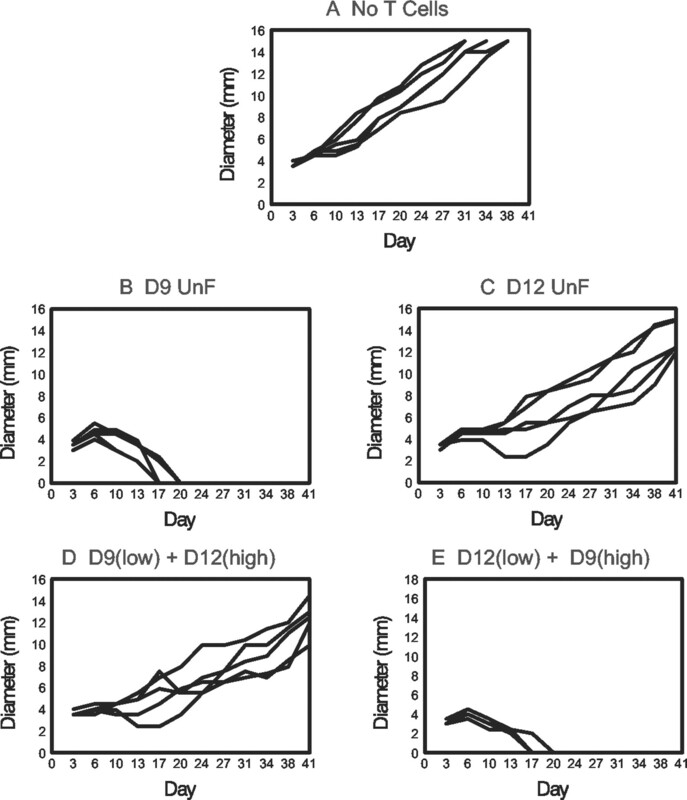 Phenotypic modulations of purified L-selectinhigh TDLN T cells during culture activation. Syngeneic B6 mice were injected intraflank with MCA-205 to enable synchronous harvest of D9 and D12 TDLN. 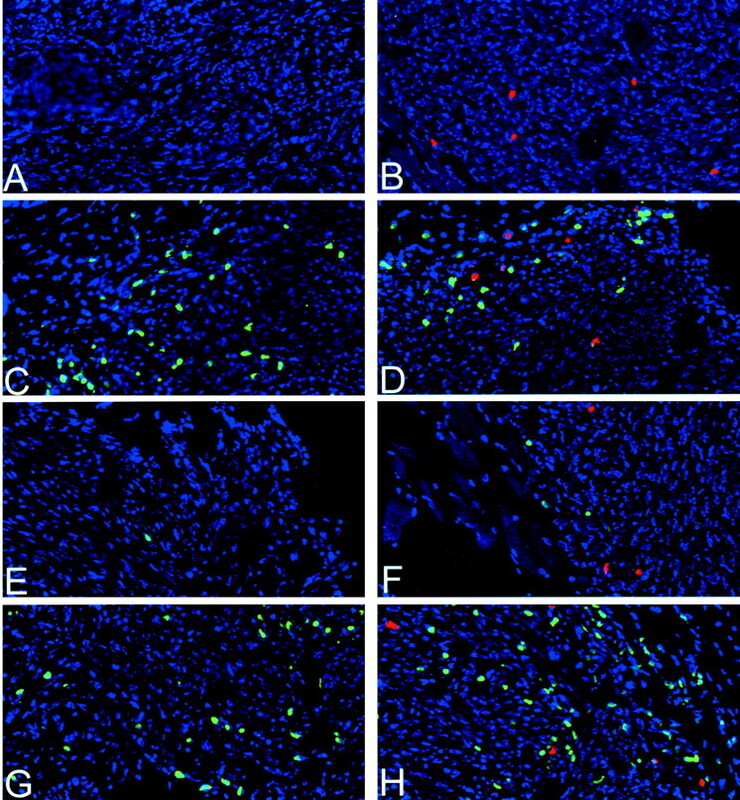 Highly purified D9 and D12 TDLN L-selectinhigh T cells were separately culture activated with anti-CD3/IL-2 for 5 days, and then harvested and stained for three-color FACS analysis, using FITC-conjugated anti-L-selectin (CD62L), various PE-conjugated mAb, and CyChrome-conjugated anti-CD4 or anti-CD8 with appropriate isotype controls. Each column shows postculture analyses for individually gated CD4+ or CD8+ components from initially L-selectinhigh D9 or D12 TDLN. Row A histograms display L-selectin expression. Rows B–F dot-plot ordinates display L-selectin expression; abscissas display representative isotype control or CD25, CTLA-4, CD28, or CD44 expression, as noted. These results are representative of three experiments. Purified L-selectinhigh D12 TDLN T cells were separately culture activated and then additionally fractionated into L-selectinhigh→high and L-selectinhigh→low components at the end of culture. These components were then individually combined with separately culture-activated L-selectinlow TE and adoptively transferred into syngeneic mice bearing relevant i.d. tumors. As depicted in Fig. 8⇓, suppressor activity was mediated only by T cell fractions containing the L-selectinhigh→low component. Only those L-selectinhigh T cells from D12 TDLN that down-regulate L-selectin expression during culture activation inhibit AIT of established i.d. tumors. Syngeneic B6 mice were injected intraflank with MCA-205 to prepare D12 TDLN T cells, from which UnF and L-selectinlow and L-selectinhigh fractions were prepared for separate culture activation. After activation, the initially L-selectinhigh fraction was also separated into subfractions with maintained expression (high→high) or down-regulated (high→low) L-selectin expression. Purified fractions were variously recombined immediately before AIT and administered to B6 mice with 3-day established MCA-205 i.d. tumors. Treatment groups (10 mice per group) were as follows: A, No T cells; B, L-selectinlow T cells (5 × 106) from D12 TDLN (D12 low); C, L-selectinlow T cells (5 × 106) from D12 TDLN plus L-selectinhigh T cells (40 × 106) from D12 TDLN without postculture fractionation (D12 low & All D12 high); D, L-selectinlow T cells (5 × 106) from D12 TDLN plus L-selectinhigh→high T cells (40 × 106) from D12 TDLN (D12 low & D12 high→high); and E, L-selectinlow T cells (5 × 106) from D12 TDLN plus L-selectinhigh→low T cells (40 × 106) from D12 TDLN (D12 low & D12 high→low). Mice received 500 rad WBI before adoptive transfer. Displays are as in Fig. 1⇑. All treatments significantly improved survival compared with the “No T cell group” (A vs B/C/D/E, p1 = 0.001). In contrast, treatment outcome (cure vs lethal or persistent tumors) was significantly different for A vs B/D (p1 = 0.001), but not for A vs C/E (p1 = 1.0). This is a composite of two experiments. Because down-regulated L-selectin expression was previously correlated to intratumoral accumulation of TE (12, 21), we examined whether intratumoral accumulation of the D12 TDLN suppressor fraction also occurred. TE from TDLN (i.e., L-selectinlow at initial TDLN harvest) were labeled with the fluorescent vital dye TRITC (red), whereas various preparations of initially L-selectinhigh TDLN T cells were pulsed with CFSE (green). Individual preparations were variously combined and adoptively transferred in proportions simulating their natural representation in UnF T cell preparations. At 24 h, mice were sacrificed and intratumoral accumulation of labeled T cells assessed by confocal microscopy. As seen in Fig. 9⇓B, TRITC-labeled, adoptively transferred L-selectinlow TE initially accumulated in small numbers at the better vascularized outer rim of the i.d. tumor bed during the first 24 h after AIT. As previously reported, such accumulation was many orders lower than their simultaneous accumulation during this interval in better vascularized pulmonary and intracranial tumors (12, 21). Nonetheless, as shown in Figs. 1–6⇑⇑⇑⇑⇑⇑ and 8, even such scant and heterogeneous accumulation was sufficient to lead to i.d. tumor rejection when 5 × 106 L-selectinlow TE were administered i.v. as single-agent AIT. L-selectinhigh T cells from D12 TDLN that down-regulate L-selectin expression during culture activation can accumulate extensively within established i.d. tumors. T cell groups were prepared from D12 MCA-205-sensitized TDLN as in Fig. 8⇑. At the end of culture activation, the complete initially L-selectinhigh fraction as well as L-selectinhigh→low and L-selectinhigh→high fractions were labeled with CFSE (green vital dye), whereas the L-selectinlow TE fraction was labeled with TRITC (red vital dye). Labeled fractions (5 × 106 TRITC-labeled and/or 40 × 106 CFSE-labeled groups) were adoptively transferred to B6 mice with 3-day established MCA-205 i.d. tumors. Mice received 500 rad WBI before adoptive transfer. Twenty-four hours later, tumors were harvested and processed, as stated in Materials and Methods, for fluorescent analysis by confocal microscopy at ×100 magnification. Treatment groups were as follows: A, No T cells; B, TRITC-labeled D12 L-selectinlow TE; C, CFSE-labeled D12 L-selectinhigh T cells, without postculture fractionation (containing both L-selectinhigh→high and L-selectinhigh→low); D, Both C and B; E, CFSE-labeled D12 L-selectinhigh→high T cells; F, Both E and B; G, CFSE-labeled D12 L-selectinhigh→low T cells; H, Both G and B. This is representative of two experiments. As shown in Fig. 9⇑, G and H, the CFSE-labeled, highly suppressive L-selectinhigh→low fraction of T cells from D12 TDLN also accumulated briskly within the outer rim of the i.d. tumor bed, in contrast to the L-selectinhigh→high fraction, which lacked suppressive activity (Fig. 9⇑, E and F). Although insufficient numbers of L-selectinhigh→low CD4+ T cells could be isolated for comparison testing, purified L-selectinhigh→low CD8+ T cells accumulated in similar numbers as CD4-undepleted L-selectinhigh→low T cells (our unpublished data). Simultaneous transfer of L-selectin-down-regulated TS (CFSE-labeled) and L-selectinlow TE (TRITC-labeled) did not detectably alter either subset’s intratumoral accumulation (Fig. 9⇑B vs D and H). However, by simulating their naturally occurring proportions in UnF preparations, simultaneous transfer resulted in striking numerical predominance of the TS fraction over the TE fraction within the tumor bed (Fig. 9⇑, D and H). This predominance was attributable to the larger numbers of TS administered rather than a difference in the trafficking properties of TE and TS. Because culture-activated L-selectinhigh→low T cells from D12 TDLN traffic efficiently into tumors, they may suppress TE directly within the tumor bed following adoptive transfer. Therefore, we examined whether direct contact with TS derived from D12 TDLN could also inhibit TE function in vitro. Before adoptive transfer, MCA-205-sensitized L-selectinlow TE culture activated from D9 or D12 TDLN specifically secreted IFN-γ when exposed to the relevant MCA-205 stimulator cells in vitro, but not to MCA-207 or MCA-203 (Fig. 10⇓ and Refs. 8, 10 , and 11). In contrast, separately culture-activated, initially L-selectinhigh T cells from D9 or D12 TDLN secreted negligible amounts of IFN-γ when exposed to MCA-205. In addition, however, those separately culture-activated L-selectinhigh T cells derived from D12 TDLN caused a pronounced suppression of IFN-γ production when added to TE and MCA-205 stimulator cells (Fig. 10⇓). Such suppressive activity was markedly enriched in the L-selectinhigh→low D12 component and was also evidenced by the CD4-depleted L-selectinhigh→low D12 component (Fig. 10⇓). Separately cultured L-selectinhigh T cells from D12 TDLN that down-regulate L-selectin expression during culture activation can suppress in vitro IFN-γ production by L-selectinlow TE. T cell groups were synchronously prepared from D12 and D9 MCA-205-sensitized TDLN as in Fig. 8⇑. Following 5-day culture activation, individual or combined T cell fractions were cocultured with irradiated stimulator tumor cells (MCA-205 or MCA-207 single-cell suspensions from enzymatically digested harvested tumors) for 24 h, and supernatants were analyzed by ELISA for IFN-γ production. The following MCA-205-sensitized T cell groups were tested: UnF D9 or D12 TDLN T cells, 2 × 106 per well (D9 UnF 2E6, D12 UnF 2E6); A, D12 L-sel(low) 4E5, purified L-selectinlow D12 TDLN T cells, 0.4 × 106 per well; B, D9 L-sel(high) 1.6E6, purified L-selectinhigh D9 T cells without postculture fractionation, 1.6 × 106 per well; C, D12 L-sel(high) 1.6E6, purified L-selectinhigh D12 T cells without postculture fractionation, 1.6 × 106 per well; D, D12 L-sel(high>high) 1.6E6, purified L-selectinhigh→high D12 T cells, 1.6 × 106 per well; E, D12 L-sel(high>low) 1.6E6, purified L-selectinhigh→low D12 T cells, 1.6 × 106 per well; F, D12 L-sel(high>low) CD8 1.6E6, purified L-selectinhigh→low, CD4-depleted D12 T cells, 1.6 × 106 per well; combinations of A + B, A + C, A + D, A + E, and A + F. Supernatant content of IFN-γ is shown as pg/ml/24 h. Results are representative of three experiments. However, it is noteworthy that, despite their dual content of TE and tumor-induced TS, culture-activated D12 UnF T cells were strong producers of IFN-γ upon in vitro exposure to MCA-205 (Fig. 10⇑). Therefore, the passenger TS in UnF preparations remained functionally silent before actual adoptive transfer unless they were experimentally unmasked by separate culture activation. Various TS phenomena have been observed in tumor models during the past 25 years (22, 23, 24, 25, 26, 27, 28). Recent reports have focused on affector blockade by naturally occurring host CD4+CD25+ T cells (16, 17), which may functionally overlap T regulatory-1 and Th-3 cells prominent in the generation of oral tolerance (19). We and others recently confirmed that CD4+CD25+ T cells can negatively impact initial T cell sensitization to tumor Ag in TDLN (18, 19). Even though CD4+CD25+ T cells have been observed to secrete substances such as TGFβ and IL-10 (19, 29), many negative regulatory effects of CD4+CD25+ T cells appear to require direct cell-cell contact (16, 17, 29). Although categories of CD8+ negative regulatory cells are currently less delineated, it was recently demonstrated that plasmacytoid dendritic cells (i.e., DC2) can induce CD8+ TS that inhibit the activation of naive, but not memory, T cells via secreted IL-10 (30). The present report is the first description of TS that are spontaneously induced in TDLN early in tumor progression and that induce effector rather than afferent blockade. Only the L-selectinhigh→low fraction of culture-activated D12 TDLN T cells displayed inhibitory properties both in vitro and in vivo, indicating that suppressor activation was inextricably linked to acquisition of the down-regulated L-selectinlow phenotype that is also associated with enhanced trafficking by memory effector T cells into peripheral tissues and tumor. The capacity of these TS to coaccumulate with TE within the tumor bed (Fig. 9⇑) may account for their distinctive ability to prevent tumor rejection by already sensitized and activated TE. Ironically, the same culture stimuli used to activate TE before AIT also activate TS coresident in the TDLN. Effector blockade by tumor-induced TDLN TS is strikingly evident in the AIT of even early (3-day) established i.d. tumors. Historically, experimental i.d. tumors have long been recognized as being poorly susceptible to AIT (9, 11, 12, 14). The reason(s) for this resistance remains conjectural but is probably linked to relatively constrained tumor vascularization at this experimental inoculation site. The initial accumulation of systemically administered TE within experimental i.d. tumors is several logs lower than their accumulation within better vascularized experimental pulmonary or intracranial tumors (12) and is at first confined to the outer tumor rim (Fig. 9⇑B). Remarkably, unless TS are coadministered, TE remain highly effective for mediating i.d. tumor rejection. During effective therapy, the presence of T cells within i.d. tumors increases over days to weeks and extends more deeply into the tumor bed (31). Such increases appear to represent a combination of additional TE recruitment and intratumoral TE proliferation (11, 31).4 However, given this attenuated rejection process, it is unsurprising that TE at the i.d. location display a particular susceptibility to tumor-induced TS, which is not evident in the treatment of 3-day pulmonary or intracranial tumors ( Figs. 1–6⇑⇑⇑⇑⇑⇑ and 8). A similar effector blockade by tumor-induced TDLN TS is likely to be operative in more advanced tumor models at additional anatomic locations, signaled by a disproportionate resistance to adoptively transferred UnF T cells from D12 TDLN. For example, 15 × 106 L-selectinlow TE purified from D12 TDLN can be culture activated and adoptively transferred to cure advanced (10-day established) intracranial tumors, but even 200 × 106 UnF T cells from the same source are consistently ineffective, despite an L-selectinlow TE content exceeding 25 × 106 (21). The TS characterized in the present report were phenotypically L-selectinhigh when initially harvested from TDLN, but down-regulated L-selectin expression during culture activation with anti-CD3 plus IL-2. We previously demonstrated that phenotypically low expression of L-selectin rather than Ag specificity correlated to the enhanced ability of TE to gain entry to tumors following adoptive transfer (12), and this observation is now extended to L-selectinhigh→low tumor-induced TS (Fig. 9⇑). Furthermore, consistent with our earlier studies, similarly enhanced intratumoral accumulation is also observed for L-selectinhigh T cells from both D9 TDLN and normal spleen after they are culture activated (i.e., largely L-selectin down-regulated), even though they lack either effector or suppressor function (Fig. 4⇑ and our unpublished data). Therefore, enhanced T cell intratumoral accumulation is frequently observed in conjunction with culture activation and L-selectin down-regulation; can be variously associated with memory effector function, suppressor function, or no therapeutic impact; and does not appear to be Ag restricted. FACS analyses have not yet revealed clearly distinctive modulations in the D12 TDLN L-selectinhigh→low subpopulation that would phenotypically link these tumor-induced TS to previously described CD8+CD28low (32) or CD4+CD25+ (29) suppressor subpopulations (Fig. 7⇑). The L-selectinhigh→low TS fraction contained far more CD8+ than CD4+ T cells following 5-day culture activation due to the CD8+ subset’s greater propensity to proliferate and down-regulate L-selectin (e.g., Fig. 7⇑A). Following L-selectin down-regulation, CD8+ TS were phenotypically indistinguishable from L-selectinlow CD8+ helper-independent TE (11), and could both mediate suppression and traffic into the tumor bed in the absence of the CD4+ subset (Fig. 10⇑ and our unpublished data). Due to the relative scarcity of L-selectinhigh→low CD4+ TDLN T cells at the end of 5-day culture (Fig. 7⇑A), it was not possible to purify sufficient numbers to determine whether the CD4+ subset also mediates suppression independently. Ongoing efforts to expand TS in long-term culture may enable meaningful functional comparisons of purified L-selectinhigh→ low CD4+ and CD8+ subsets. Despite their putative TS content and impaired ability to reject i.d. tumors ( Figs. 1–5⇑⇑⇑⇑⇑), culture-activated UnF T cells from D12 TDLN displayed robust IFN-γ production upon tumor exposure in vitro (Fig. 10⇑). 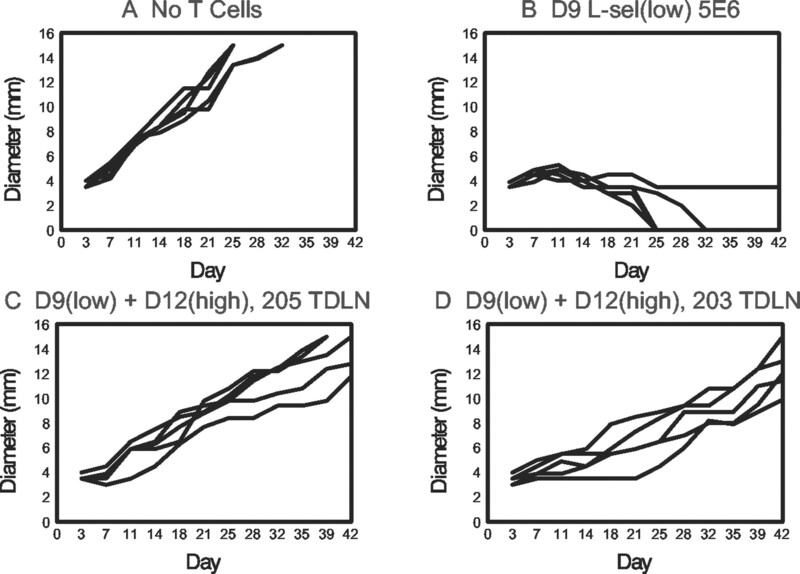 In contrast, separately culture-activated L-selectinhigh→low TS from the same D12 TDLN demonstrably inhibited the function of L-selectinlow TE both in vitro (IFN-γ production, Fig. 10⇑) and in vivo (rejection of i.d. tumors, Fig. 8⇑). Given this disparity, the mechanistic relevance of experimentally observed in vitro suppression to in vivo effector blockade by TS is presently uncertain. Furthermore, because IFN-γ secretion itself is unessential for TE-mediated rejection of experimental i.d. tumors (33), suppression of other elements of TE function (e.g., intratumoral TE proliferation)4 is more likely to be relevant to in vivo effector blockade. Therefore, ongoing mechanistic studies are focused principally on in vivo rather than in vitro perturbation by TS. Experiments are also in progress to determine whether observed cross-suppression (Fig. 6⇑) reflects a true lack of classical Ag or MHC restriction, or rather an MHC-restricted cross-reactivity to shared tumor Ag. Because only TE could be culture activated from D9 TDLN, whereas both TE and TS could be culture activated from D12 TDLN, it is likely that sensitization of memory TE temporally precedes tumor induction of L-selectinhigh TS. Because TS function was not apparent either in vitro or in vivo in the absence of down-regulated L-selectin expression ( Figs. 7–10⇑⇑⇑⇑), the L-selectinhigh fraction within D12 TDLN most likely constitutes as-yet-unactivated TS. Furthermore, given the high therapeutic potency of L-selectinlow TE isolated from D12 TDLN (e.g., Figs. 2–4⇑⇑⇑), it is unlikely that this fraction contains significant numbers of L-selectinhigh→low TS. However, it remains to be determined whether continued tumor progression results in a natural appearance of L-selectinhigh→low TS within TDLN after D12, leading to functional subversion of TE within the L-selectinlow fraction. This would be consistent with the observed inability to activate functional TE from TDLN by day 21 of tumor bearing (our unpublished data and Ref. 34). Historically, many AIT strategies have cured experimental murine pulmonary tumors yet failed to cure experimental i.d. tumors (9, 15). The present studies clearly demonstrate that failure to cure established murine i.d. tumors can result simply from the inadvertent cotransfer of passenger TS, even when otherwise sufficient doses of TE were adoptively transferred. While the clinical relevance of these observations remains to be determined, the failure of clinical AIT trials in the past, frequently despite in vitro evidence that potent TE were administered (35, 36), may also have its roots in the inadvertent coadministration of passenger TS rather than a failure to administer adequate doses of functional TE per se. Although trafficking of administered TE into patient tumors has been observed in previous clinical studies (37, 38), the low magnitude and unevenness of intratumoral T cell accumulation parallels that typically observed at mouse i.d. tumor sites (12, 21). Furthermore, as demonstrated in Fig. 10⇑, therapeutically ruinous tumor-induced TS can be functionally silent during routine in vitro assays of UnF T cell preparations before their administration. In mouse models of AIT that use D12 TDLN as a source of anti-tumor TE, distinctively high initial expression of L-selectin allows for ready removal of unactivated TS before culture activation. Similar L-selectin or CCR7-based separations may be considerably more difficult to achieve in animals and patients with longer-established tumors, because activation and L-selectin down-regulation of TS may already have occurred, leading not only to nodal paralysis but also to redistribution and even active tumor bed colonization by L-selectin-down-regulated TS. Therefore, we are actively pursuing additional phenotypic distinctions that would permit clear delineation of L-selectin-down-regulated TS from L-selectin-down-regulated TE. Identification of specific factors mediating L-selectinhigh→low T cell suppression may additionally facilitate in vitro detection of potentially detrimental TS activity before adoptive transfer. Finally, we are investigating the ability of adjunct costimulatory or T1-promoting treatments such as OX-40 ligation and IL-12 to compensate for an enduring presence of passenger L-selectinhigh→low TS (21, 39), thereby enabling UnF TDLN T cells to be effectively deployed as AIT even when passenger TS cannot readily be purged. ↵1 This work was supported by National Cancer Institute Grants R01 CA89511 and R01 CA78263. ↵3 Abbreviations used in this paper: TDLN, tumor-draining lymph node; AIT, adoptive immunotherapy; D9, day 9; D12, day 12; i.d., intradermal; WBI, whole body irradiation; TE, effector T cells; TS, suppressor T cells; TRITC, tetramethylrhodamine isothiocyanate; TSTA, tumor-specific transplantation Ag; UnF, unfractionated. ↵4 J. Kjaergäard, L. Peng, P. A. Cohen, and S. Shu. Therapeutic efficacy of adoptive immunotherapy is predicated on in vivo Ag-specific proliferation of donor T cells. Submitted for publication. Cohen, P. A., D. J. Fowler, H. Kim, R. L. White, B. J. Czerniecki, C. Carter, R. E. Gress, S. A. Rosenberg. 1994. Propagation of murine and human T cells with defined antigen specificity and function. I. Frazer, and D. Chadwick, and J. Marsh, eds. Ciba Foundation Symposium No. 187: Vaccines Against Virally Induced Cancers 179 Wiley, Chichester, U.K.